This soup has grown extremely popular outside of Italy, but you might be surprised to learn that, while it often appears as part of a traditional Italian Easter, Christmas or San Silvestro (December 26) feast. It has nothing to do with Italian weddings and never has. The confusion stems from the fact that the common name used in English is a bit of a mistranslation of the Italian name for this soup, a traditional dish originating in Naples made with an assortment of dark-green, somewhat bitter vegetables (which could include any combination of: chicory, escarole, an ancient Neapolitan curly kale called torzella, Savoy cabbage, puntarelle, borage, etc. ), meat (traditionally any combination of boiled pork and/or beef, guanciale, pork ribs, ham hocks, lard, and/or sausage) and a rich meat broth. Basically, like many Italian recipes, it was a peasant dish, made with whatever leftover bits of meat one might have and plenty of local and wild greens. In a large, deep stockpot, heat the olive oil and garlic over medium heat until the garlic is just fragrant and very lightly colored, about 1 minute. Add the crushed red pepper and simmer for about 30 seconds. Meanwhile, blanch the chopped greens in abundant salted boiling water, 1 to 2 minutes, then drain well. This eliminates the excess bitterness. Remove the onion, carrot, and celery from the broth and discard (discard any cheese rinds at this point also, if you're using them). Transfer the blanched greens into the broth and let simmer for another 20 to 30 minutes, or until the greens are tender and the broth is rich and savory. Serve with freshly grated cheese sprinkled on top and slices of grilled or toasted crusty bread. A white wine, such as a Fiano or Greco di Tufo, would be a good pairing. The name minestra maritata actually means "married soup," rather than "wedding soup," and it refers to the "marriage" of flavors in this hearty, savory soup, which was originally intended to be a one-course meal. 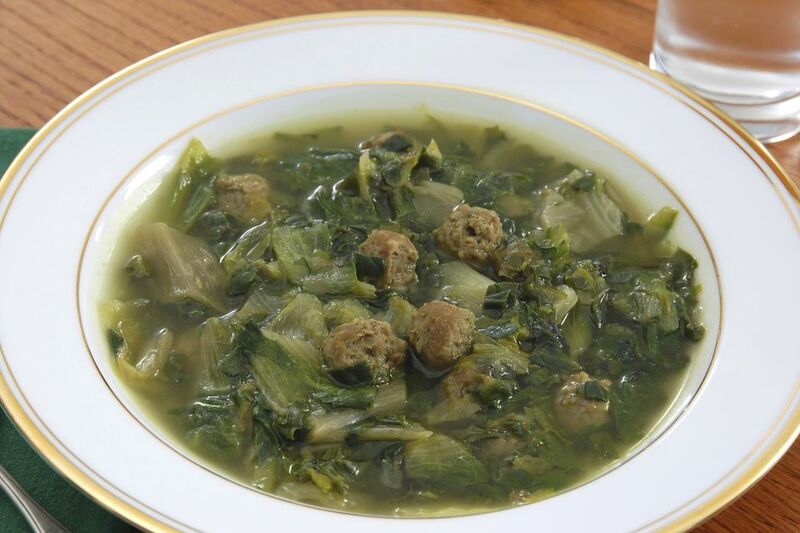 The Americanized (or Canadian) version is usually with small meatballs instead of the long-cooked meats, and often with fewer greens than the traditional Italian version, which is heavier on the vegetables, does not contain meatballs, and might have only a few pieces of meat for a large pot or soup, or even no pieces of meat at all. Versions made outside of Italy also often add rice or small pasta, though those do not appear in most traditional Italian recipes. Instead of using 5-6 kinds of vegetable and wild herbs, we'll use just 3, and instead of making a meat broth that simmers for hours, we'll start from canned broth, amping up its flavor by simmering it with a few aromatics and some pieces of Italian sausage, which stand in for both the traditional several types of meat, charcuterie, sausage and lard as well as the small meatballs of the Italian-American version. There are, of course, endless variations on the recipe, but here I've provided one that is closer to an authentic Italian version, omitting, however, ingredients that would be difficult to find outside of Italy and simplifying and streamlining it so that it can be made very quickly, rather than over the course of two days, as traditionally done. You can use whatever hearty, dark greens are in season and readily available (dandelion greens, collards, dinosaur/lacinato/Tuscan kale, curly endive [a.k.a. frisée], Swiss chard, curly kale, or beet greens come to mind as non-traditional ingredients that would nonetheless work wonderfully here! ), but try to use a mixture of at least 2 kinds.